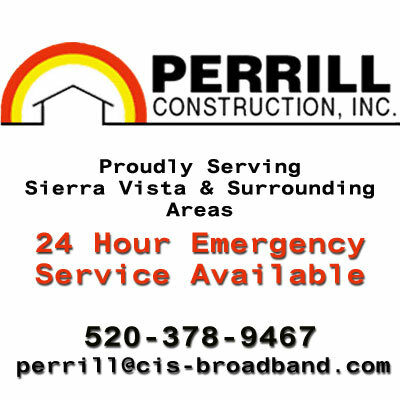 SIERRA VISTA, Ariz. - Oct. 24, 2018 - PRLog -- Perrill Construction Inc. has been providing quality home and office renovation, remodeling and remediation services in Sierra Vista for over 50 years. Recently, the Company launched a new website that details Company services and reveals expertise. Perrill Construction Inc. prides itself on integrity and quality workmanship. The new website features verified customer reviews that bring to the forefront, excellence in service. Residents of Fairbank, Tombstone, Charelston, Whetstone, Huachuca City, Elgin, Hereford, and Canelo, Sonoita, Bisbee and Miracle Valley, Ramsey Canyon and Nicksville have all benefitted from the Company (https://perrillconstruction.com/services) customer satisfaction guarantee for General Contractor services. Perrill Construction Inc. also accepts insurance jobs and works with insurance providers. The Company continually strives to give customers a seamless and detailed remodeling, renovation or remediation experience.